ACS provides construction monitoring services throughout the Northeast United States. 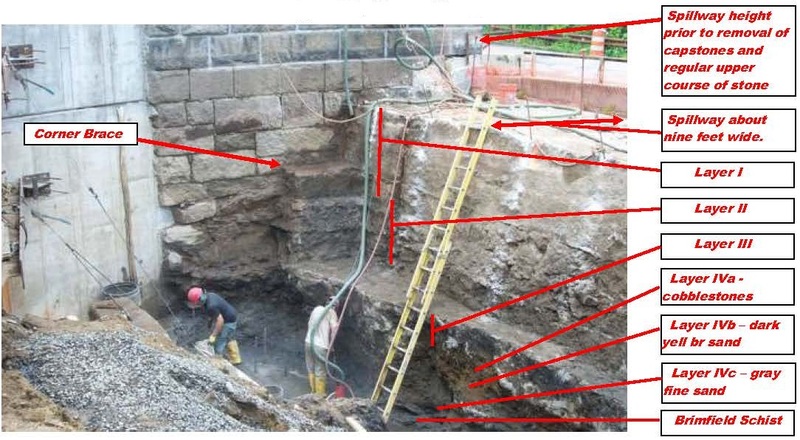 Construction monitoring is warranted in cases where potentially significant cultural resources may be present, but in a setting where traditional archaeological surveying techniques are too costly or infeasible. 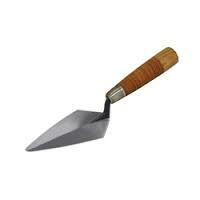 This is often the preferred method of archaeological investigations in highly disturbed, industrial, or urban settings. A late historic housing complex at Fort Totten in Queens, New York was slated to be demolished for the construction of a new recreational park. 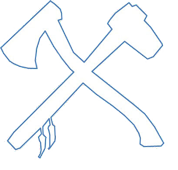 Known historic military features such as a battery compound, hospital site structural remains, and an underground ordinance storehouse site required historic documentation and archaeological construction monitoring as provided by ACS. ACS conducted construction monitoring for a historic dam improvement project at the Moodus Reservoir Dam in East Haddam, Connecticut. The Moodus Reservoir Dam was subject to improvements by the Connecticut Department of Energy & Environmental Protection, including reconstruction of the spillway, construction of a concrete cut off wall, repointing the existing masonry on the downstream face of the spillway, and construction of a new fuse plug emergency spillway. The first dam built at the site was constructed around 1865, with the current dam built in 1882 and improvements made in 1901. ACS was contracted to provide construction monitoring services, which focused on documenting any traces of the prior dam. A coffer dam allowed the construction crew to drain the area around the dam and completely expose its upstream face. Towards the bottom of the current dam, about 15 feet below the top of the spillway, traces of two training walls for the original 1865 dam were recorded about 27 feet apart and matching engineering plans for the 1882 construction. The 1901 improvements were evident after exposure of the upstream face of the dam, and ACS also documented a downstream raceway and associated remains of the Falls Mill built by inventor William E. Nichols for the manufacture of twine and fish nets. Southwest view of the corner brace at the junction of the gate chamber (left) and upstream face of the spillway (right). A trace of the upper two courses of stone removed at the top, including the capstones, are visible at the top of the truncated spillway against the exterior surface of the gate chamber. Ladder rungs one foot on center. West view of the upstream face of the spillway. Note the layering that relates to different construction episodes, including the upper five feet relating to the 1902-1903 final heightening of the dam with larger mortared blocks; the 1882-1883 layers of mortared fieldstone or rubble; and the lower layer of mortared rubble that could partially represent the circa 1865 spillway. ACS provided archaeological monitoring for the project in order to document any surviving traces of important historic military features that could be impacted by the demolition and/or subsequent landscaping. 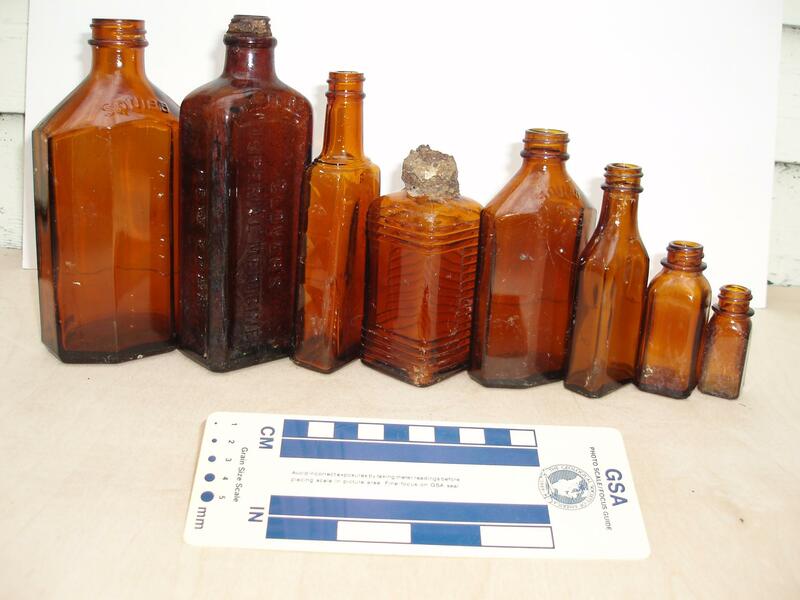 Next to the battery facility from which heavy mortars would be discharged, ACS documented the remains of a mid-20th Century bottle dump which provided a view of military family consumption practices and has implications for changes in disposal methods at the facility over time. 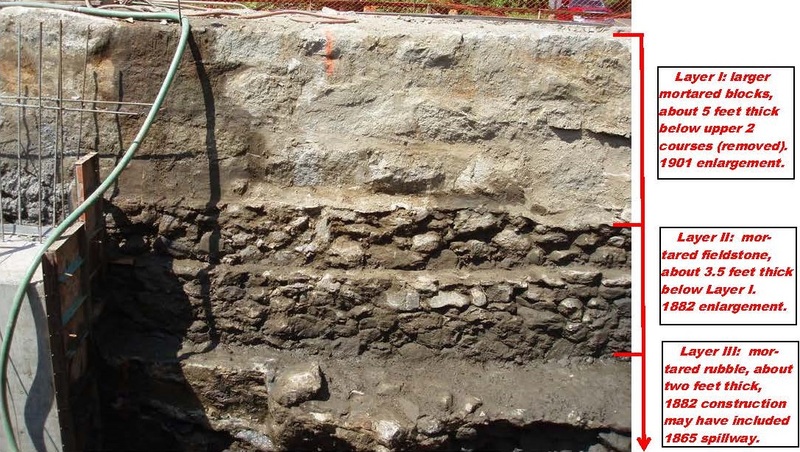 Some structural traces of the foundation for the former fourth hospital building were also recorded towards the center of the project area, while there were no positive traces of the storehouse or associated ordinance encountered. Established during the Revolutionary War, the main surviving structure at the Springfield Armory in Massachusetts now serves as a museum. 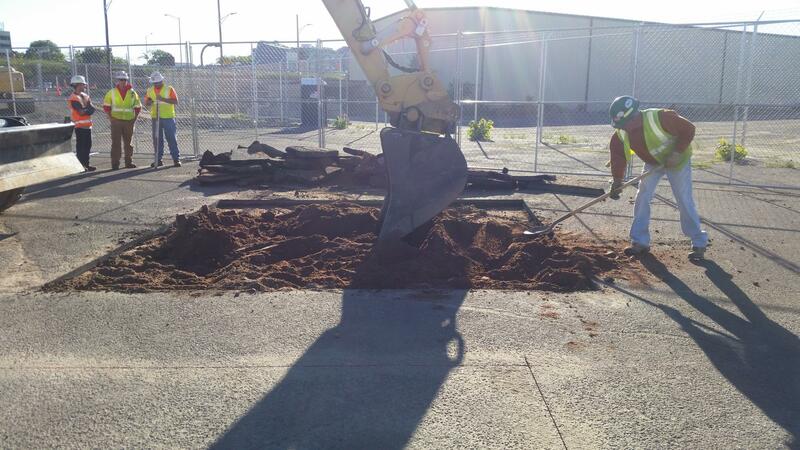 Drainage and parking improvements at the site revealed traces of historic structural remains likely representing encampment and blacksmithing activities. The Springfield Armory was established in 1777 to house a laboratory for the manufacture of gunpowder and an arsenal for the storage of weapons supplied to colonial troops. The western part of the facility that was the focus of archaeological construction monitoring for drainage and parking improvements was the site of residential facilities of the armory. The main arsenal building of the project area constructed in 1841 now serves as the museum. The facility in general was the United States Army’s principal research and development laboratory until 1968 when it was closed. In 1974, the Springfield Armoy was designated as a National Historic Site, thus prompting the call for archaeological monitoring for proposed improvements. This project took place at the site of the original arsenal building, now a museum, as well as the historic superintendent’s residence building to the north. A prior survey revealed a range of historic materials and artifacts, but mostly in highly disturbed contexts. New Haven was an important regional port in southern New England, as exemplified by the Long Wharf of the 18th Century, the Farmington Canal of the 1820s, and the New Haven & Northampton Railroad of the 1840s that all met at a part of New Haven Harbor in what became known as Union Basin. After the failure of the Farmington Canal, Union Basin underwent a series of infilling in the mid to late 19th Century in order to accommodate the railroad and its maintenance facilities in what was known as the New Haven Rail Yard. Excavation trenches for the project revealed numerous features, including cribbing related to the infilling of the harbor, traces of a roundhouse, and a brick-lined drainage feature. Cribbing included vertical piles and horizontal timbers set into the mucky soil of the harbor, and dates to the mid-19th Century. The first round house that once occupied the center of the yard and was used for the repair of multiple trains brought in on a large turntable dates to around 1850, with observed possible traces including a large mason block and brick section. The late 19th to early 20th Century intact drainage feature encountered was an octagonal-shaped brick-lined manhole with traces of wooden duct work, likely serving to detain and redistribute water from train cars that were cleaned in the yard. Northwest view of the northern training wall feature from the original circa 1865 dam. 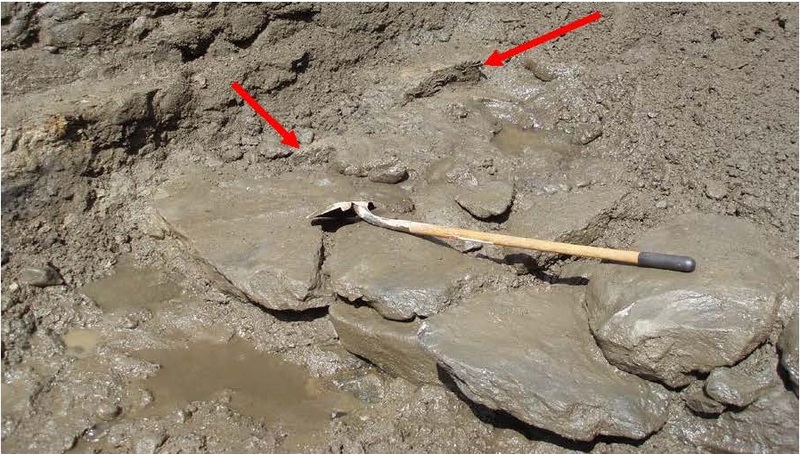 The feature was truncated where it would have met the upstream face of the spillway, with traces of intervening cedar planking visible (indicated by red arrows above and above-right of the shovel head). Note the lower shelf layer of mortared rubble tapering into the upstream spillway wall in the vicinity of the training wall feature. Fort Totten is on a peninsula of Little Neck Bay, strategically located to protect the waters accessing the East River of New York City. The fort was established during the Civil War, and contains a great variety of mid-19th to early 20th Century structures. The northern part of the fort complex contains a mid-20th Century housing development for military staff, and was acquired by the New York City Department of Parks and Recreation for the creation of North Park after the removal of 19 buildings. 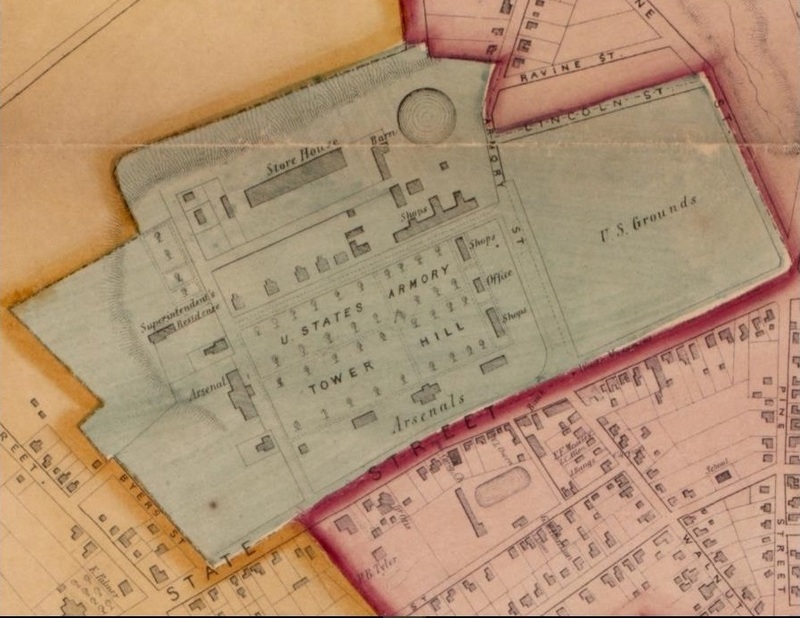 This area contained several important military facililties, including the “Battery King” of 1871, the late 1880s fourth hospital built on the grounds, and an 1890 ordinance storehouse area. ACS conducted construction monitoring for a power upgrade and switchgear project at the rail yard by the Connecticut Department of Transportation. Power upgrades proposed for the expansion of the New Haven Rail Yard required construction monitoring given that the yard is the site of one of the oldest railroad facilities in the region. 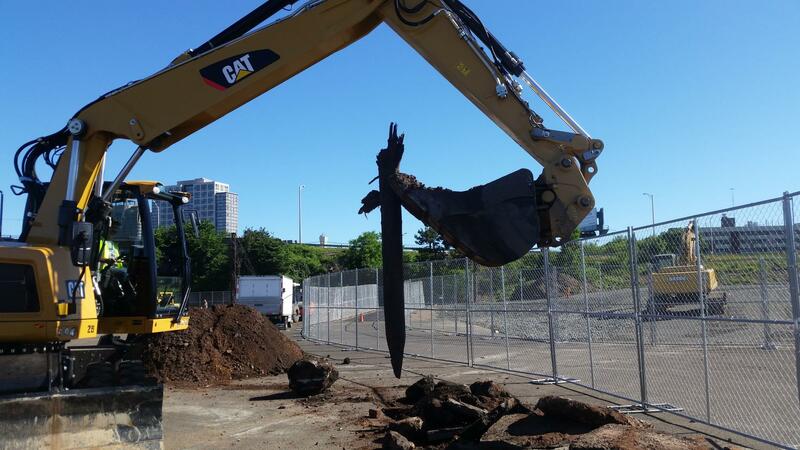 ACS documented traces of historic railroad repair and maintenance features, as well as historic cribbing and fill used to create the yard in an area that once was part of the New Haven harbor next to Long Wharf. ACS recommended no further conservation efforts for the bottle dump area which was documented sufficiently, but recommended monitoring for any future developments around the historically mapped “death house” and “ambulance shed” areas related to the hospital site, as well as an area revealing a late 18th through mid-19th Century cluster of artifacts possibly related to the occupation of the property before the construction of the fort. Most of the project area revealed highly disturbed subsurface contexts, with an array of structural, domestic, and personal artifacts reflecting more than 200 years of occupation of the site. There were very few military items encountered. The most significant site context was found along the southern State Street boundary where a proposed drainage swale was to be constructed. The stripping of soil under the direction of the Principal Investigator revealed soil stains in the subsoil of an area measuring about 15 by 15 feet. Recovered artifacts include hand-wrought nails, creamware ceramic sherds, lead pieces, and charcoal. The dimensions of the feature area and contents are consistent with Revolutionary War era soldier’s huts, which would have been earthfast structures without foundations.